One can forgive moviegoers who greeted 2015’s Steve Jobs with a feeling of déjà vu. After all, the similarly titled Jobs came out just two years earlier, so some cinematic confusion became inevitable. While the 2013 Jobs lacked “A”-list talent, Steve Jobs altered that equation. With Oscar-winners or nominees at many positions, Steve Jobs seemed destined for big things. Or maybe not. The movie got good reviews but audiences ignored it, as the film maybe a pathetic $17 million in the US. It still landed two Oscar nominations – both for acting – but fell short of the awards glory one would have expected it to receive. Rather that give us a traditional biopic, Steve Jobs provides a snapshot of its characters on three different occasions. 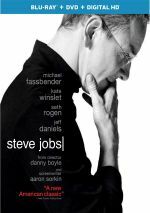 The movie uses product launches to show the life of Jobs (Michael Fassbender) as well as his long-time/long-suffering assistant Joanna Hoffman (Kate Winslet), Apple II co-creator Steve Wozniak (Seth Rogen), and Apple CEO John Sculley (Jeff Daniels). Steve Jobs also lets us get to know Jobs’ out-of-wedlock daughter Lisa at the ages of 5 (Makenzie Moss), 9 (Ripley Sobo) and 19 (Perla Haney-Jardine). Steve Jobs opens in 1984 with the launch for a new computer called the “Macintosh”. From there we go to 1988 and see Jobs – no longer at Apple – as he promotes a desktop called the “NeXT”, and we finish in 2008. With Jobs back at Apple, he launches another new device named the “iMac”. As I’ve mentioned in other reviews, I prefer biopics that don’t attempt to cover huge swaths of time. Ones that go for a broad time frame inevitably feel thin and rushed because they try to pack in way more information than they can comfortably achieve within their relatively brief running times. I feel more satisfied with biographies that choose a fairly compact part of their subjects’ lives and thus give us more depth. The three-part structure of Steve Jobs feels like a compromise between the “epic” biopic and the more limited one. Technically, it spans 14 years, but since it sticks with only three specific days in that time span, it narrows its focus to a more intimate level. That’s the other unusual decision: to show Jobs and the rest a) only at product launches and b) only on single days. Actually, that’s not entirely true, as the film does offer periodic flashbacks, but the story really exists just on those launch dates, and the events take place in a very confined amount of time. This is a tremendously contrived notion, especially given how much interpersonal drama occurs during those events. The odds that so many big events would take place right before Jobs introduces a new product makes no logical sense. Jobs even quips about it late in the film, so it appears the filmmakers wink at this contrivance. As tough as it may be to swallow the dramatic construct in a logical sense, it works, as the movie becomes a surprisingly involving and three-dimensional look at its subject. Even though it sticks heavily with its characters during tight time frames, it delivers a broader, more dynamic examination of these people than the vast majority of more all-encompassing biopics. At its heart, the film wants to tell us about the relationship between Jobs and Lisa. Again, the way these elements develop remains pretty contrived, but these moments suit the story well and allow us to see the growth and development. On the surface, Jobs takes baby steps in his acceptance and love for Lisa, but we can see how far he comes by the end. It’s the subtlety I appreciate about Jobs. At no point does it give us a big revelation, and we get no weepy, sudsy emotional moment between Jobs and Lisa. The film also doesn’t attempt to totally redeem Jobs by the end. Some of the people he treats poorly at the beginning receive similar treatment by the end – particularly Wozniak, whose quixotic quest to attain recognition of the Apple II team becomes uglier and uglier with each passing launch. I regard the fact Jobs doesn’t fully soften its subject as a good thing, for it feels real. For all his visionary tendencies, Jobs doesn’t appear to have been an especially nice person, and the movie lets us see that. We can appreciate his positives and understand why people gravitated to him, but at no point does the movie venerate Jobs or put him on a pedestal. As a protagonist, he shows massive flaws. But he does grow and mature – again, especially related to Lisa. Jobs never fully admits his mistakes, and as mentioned, we never get the big, teary embrace between father and daughter we might expect. Those choices make the ending much more meaningful. Though the story ends with a very low-key reconciliation, it seems quite emotional. After all the tension and terrible behavior, we see that Jobs has grown up – albeit in his own restricted manner. Fassbender doesn’t look the least bit like Jobs, but he embodies the character well. He gives us the requisite magnetism but never attempts to give us a kinder, gentler Jobs – he maintains a pretty arrogant, self-absorbed personality most of the time, with just the smallest dollops of humanization along the way. Fassbender does great work, and a terrific supporting cast helps him. When I saw Steve Jobs theatrically, I liked it but wasn’t wild about it. Perhaps my expectations for a more traditional biopic impacted my appreciation of it. On second viewing, I feel much more positively about the film and think it delivers an excellent and unconventional view of an iconic figure. It’s one of the best movie biographies I’ve ever seen. Steve Jobs appears in an aspect ratio of approximately 2.40:1 on this Blu-ray Disc. An unusual product visually, Steve Jobs had inevitable ups and downs due to its choices, but it looked good. As noted in the body of this review, the film split into three different segments, and each got its own photographic style. The 1984 scenes used 16mm while the 1988 parts opted for 35mm. Finally, 1998 finished with digital photography. Inevitably, the 1984 shots looked worst, as they displayed the limitations of 16mm. Overall sharpness was fine, but some softness appeared as well, and colors tended to be a bit mushy. The 16mm parts went with a teal orientation much of the time, and these tones seemed somewhat dense. Blacks were on the inky side, and shadows were a little heavy. The 16mm shots showed a number of small specks, thought I hesitate to call them “print flaws” since they were clearly an intentional choice by the filmmakers. With the 35mm shots, they demonstrated clear improvements. These segments displayed solid, with only a smidgen of softness on occasion. Unlike the 16mm material, the 35mm work lacked any specks or marks. While the 35mm footage maintained a bit of a teal feel, it tended toward a chillier orientation than the 16mm pieces. These showed more accurate rendering and offered clear colors. Blacks were deep and firm, and low-light shots appeared smooth. I felt wholly pleased with the 35mm segments. Finally, the digital footage to depict 1998 mostly resembled the 35mm material. I thought the digital shots were a smidgen softer than the 35mm work, but definition was close. Everything else looked a lot the same, with an other teal palette and good blacks/shadows. All of this added up to an interesting mixed bag of visuals I felt merited a “B”. While the movie’s visuals varied dependent on time periods, its DTS-HD MA 5.1 soundtrack remained consistent – and consistently low-key, as one would expect for a chatty biopic like this. Music used all five channels nicely, and general ambience filled the speakers well. The latter tended toward crowd noise at the product launches and not much else. I had no problem with these choices, as they made sense for the film’s story. Audio quality worked fine. Speech appeared accurate and distinctive, while effects were accurate and concise. Music sounded full and rich. Nothing here dazzled, but the soundtrack suited the tale. When we move to the disc’s extras, we find two separate audio commentaries. The first comes from director Danny Boyle, as he provides a running, screen-specific look at the production schedule and editing, cast and performances, character/story areas, sets and locations, music, cinematography and visual choices. Bright and engaged, Boyle offers a fine discussion of the film. He covers a wide range of topics and does so in an enjoyable manner. Those factors turn this into a winning commentary. For the second commentary, we hear from screenwriter Aaron Sorkin and editor Elliot Graham. Both sit together for their running, screen-specific look at story/character/script areas, editing and cut lines/scenes, cast and performances, sets and locations, and related domains. On the slightly disappointing side, Sorkin doesn’t talk a ton about his work. Indeed, at times it feels like he’s there to interview Graham, as he gets the editor to discuss aspects of his career. Though I would’ve liked to know more about Sorkin’s processes, I still think the commentary works well, mainly because he and Graham interact in a vivid manner. They give us good insights connected to the script and editing, especially when they discuss some of the bits left on the cutting room floor. Overall, this becomes a very good chat. Inside Jobs: The Making of Steve Jobs runs 44 minutes, 11 seconds and includes comments from Boyle, Sorkin, Graham, costume designer Suttirat Larlarb, property master Chris Ubeck, location manager Chris Baugh, director of photography Alwin H. Kuchler, production designer Guy Hendrix Dyas, composer Daniel Pemberton, and actors Michael Fassbender, Seth Rogen, Jeff Daniels, Kate Winslet, and Michael Stuhlbarg. We get notes about cast, characters and performances, the screenplay, Boyle’s impact on the production, rehearsals, locations and camerawork, music, and general notes. After two commentaries, “Inside” expands horizons well enough. It’s good to hear from the actors, and the behind the scenes footage helps turn this into a useful program. The disc opens with ads for Legend, Secret In Their Eyes, Suffragette, The Danish Girl, Spotlight, Mr. Robot and Trumbo. No trailer for Steve Jobs appears here. A second disc provides a DVD copy of Steve Jobs. It includes the same extras as the Blu-ray. An unconventional biopic, Steve Jobs provides a wholly engaging take on its subject matter. The film depicts its subjects in a creative manner that allows it to prosper and work better than it would had it utilized less creative methods. The Blu-ray offers fairly good picture and audio along with a collection of informative supplements. Steve Jobs achieves its goals and becomes a great film.